Peter Stancato is the founder of the new bouldering gym in Lakewood, Nosotros. Located in the basement of Lakewood Baptist church, Nosotros is a small place born from his big idea. “This project started in November 2011. My wife was invited to be a bridesmaid at a wedding in Columbus. I was the +1. She knew everyone. I knew no one. The groom felt bad for me so he invited me to climb with him and his groomsmen on the morning of the wedding. I was big into sports, but I never played this one. It was my first time bouldering and my first time meeting these guys. I expected them to ignore me and instead they encouraged me. I fell in love with climbing and wrote a business plan a week later. For the next seven years I saved up money to launch,” Peter relays on what brought about this idea. The project launched in March 8th, 2018 and since then has kept a steady momentum, Peter reporting that they have managed to stay above red since day one. Peter worked on the idea whilst being in the Air-Force part-time, part-time student, and a full-time social worker (and an all-time husband). Every quarter they take the money raised and help others in the community. Stancato’s gym offers the cheapest climbing rates for gyms in the area–a day pass being 12 and shoes rentals being 3. He hopes to do more to attract the young adult population, ushering Tuesday as student- ID day where teens can pick the music played and the gym will have giveaways for the patrons. In personal experience, the place has a chill environment and a layout that allows one to climb safely and at any skill set (each course being labeled by color so one can stick to these directions for an easy ascent or can free climb, taking any hold they can reach). A small space takes advantage with small caves and dips, angled ascents to give the different challenges and obstacles. The staff members are kind and care about the gym’s core values of “we.” Want to help? 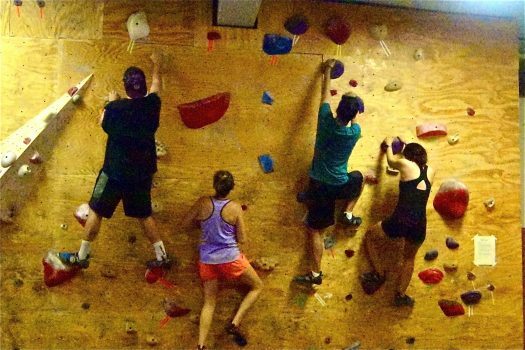 One can give their patronage to the gym or volunteer to help this non-profit climbing gym (being the second of its kind in America).